Vet-Strength Antimicrobial Formulation Exclusively For Veterinarians! 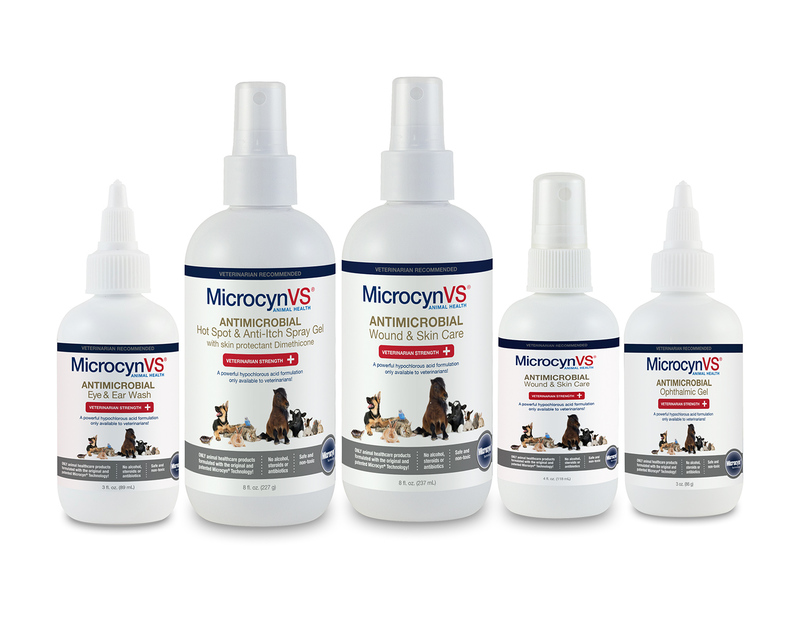 Veterinarians, click here to order your FREE bottle of MicrocynVS®! Veterinarian-Strength MicrocynVS® Formulations for Management of Wound, Skin, Ear and Eye Afflictions in All Animals! MicrocynVS® Veterinarian-Strength products are one-step wound, skin, eye and ear formulations designed to assist the animal’s body in its own healing process. The vast majority of wounds, lacerations, rashes and infections encountered by veterinarians can be addressed with just these five third-generation MicrocynVS® products. No need to overburden your shelves with repetitive inventory. MicrocynVS® Veterinarian-Strength is one of the most powerful hypochlorous acid formulations on the market today. Typically priced below that of competitive products, MicrocynVS® Veterinarian-Strength is available only to veterinarians and their staff—for clinical use and to dispense. It is not sold in retail stores or online. The third-generation Microcyn® Technology, which is at the heart of all the MicrocynVS® formulations, has received 16 FDA clearances for use in humans, is validated by over 30 clinical studies and protected by over 45 patents worldwide. With the safety profile of saline, MicrocynVS® safely eradicates most bacteria, viruses, fungi and spores to 99.9999% in just thirty seconds in solution. With an average shelf stability of two years or more, MicrocynVS® is guaranteed to remain efficacious if within its expiration dating.